Sitar Practice CD For Beatles Sitar Songs Sitar Rock Songs Moody Blues Sitar Songs - The Best Gift for the Sitar Player - Austin Sitar's "Play Along CD"
Introducing the Austin Sitar "Play Along" CD Series! were originally performed in keys that are not natural to the sitar. performed in the key of E. The recording tape was then "vari-speeded"
Sample One - "Scandinavian Furniture" in the Style of "Norwegian Wood" - Click Here! Sample Two - "Om For Sitar" - Click Here! Chuck Morrow in the Austin, Texas area. Sitar Player for Weddings or Other Events in Central Texas! Click Here For My Latest Sitar and Tabla Duet - "Wedding Dance"
Sitar for Recording Sessions in the Austin, Texas area. joyful atmosphere with a distinctive Indian flavor. The sitar is a very difficult instrument to learn as one's first instrument. such as the piano or guitar. It is not necessary to be able to read music. I am also a veteran professional bass guitarist! Click Here to Contact Me With Sitar or Bass Related Questions! Or Call 512-402-5947 for More Information! I have been a professional bass guitarist for over 30 years. Some years ago, I met a fellow bassist, Peter Cutchey. He had retired from the music industry and set up business here in Austin, Texas pursuing one of his life's passions - the sitar. We became friends, and eventually I heard him play sitar. He had a unique approach to the sitar, incorporating modern guitar effects such as delay and chorus in his music. The sounds were truly hypnotic! He had developed a style that was calming and peaceful - a nice change from some of the frantic Indian music many of us have heard. Peter's ideas inspired me, and I have taken those ideas a small step further - including retuning the sitar to better suit Western harmonies, and developing new ways to use a traditionally tuned sitar within a Western "song" framework. Compared to the guitar or piano, the sitar is somewhat limited. It is a mostly melodic instrument. As a consequence, as you learn to play the sitar, you necessarily explore and expand your command of the more basic elements of all music - tempo and loudness as well as pitch. Harmony and chords can only be considered in the context of melodic construction. Fortunately for us all, the Indian scales are very similar to Western scales. So, In the course of learning the sitar, a student will gain a perspective on scales and modes. By the time the student has a basic understanding of the sitar, he/she will have a more intuitive understanding of a Western instrument, such as a guitar or piano. I am not fully qualified to teach authentic "Indian" music. To learn ragas - real Indian sitar music - you also have to learn a foreign language. All the notes, techniques, and compositional elements are only known in Hindi (the language of India). I do not know if I even pronounce the words correctly! This is a big hurdle for anyone who doesn't speak Hindi. It is also difficult to find recordings of "simple" Indian music. Traditional Indian music is highly structured and is deeply rooted in religious philosophy. If a student wished to learn this aspect of the sitar I can only teach the very background material. 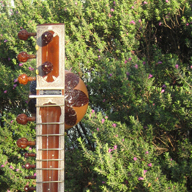 The first few lessons in sitar involve tuning and maintaining the instrument. In my experience, sitars are not ready to play at the time of purchase..they need a few hours of individual attention ("tweaking") first. The student needs to know how to do simple maintenance such as changing a string or tying a fret before he/she even plays a note. I find that many beginner and even mid-level quality sitars have had the frets tied on in the wrong locations. So a quick piece of advice I can give is not to buy the cheapest sitar that you can find. You will only spend more money later on tweaking, and still have an inferior sound for the money when it's all said and done! In the worst cases, you may find that the holes for the tuning pegs have actually been drilled in the wrong places! There is no fix for a problem like that..you may just have to leave that particular string or fret off the instrument - you can't use it. This situation would almost never occur on your first guitar, violin, or other Western instrument. Keep in mind that sitars are literally made by hand, with no computerized machinery or standardizations such as we have become accustomed to here in the West. Each sitar is different, and the cheapest ones are built by novices!